Probably made at Winchester, although it is not certain by or for which religious house there, the Arundel Psalter seems to have been a personal prayerbook. Throughout the middle ages, the psalter served as a book for services and as a personal devotional book. 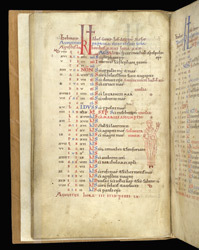 Individualistic choice of saints for its calendar and litany as well as Old English glosses on the Latin text suggest this one was used for private prayer. The calendar would have helped its owner coordinate prayers with feast days and the litany would have been a special personal petition to especially revered or beloved saints. One page of the calendar (August and September) shows the listing of feast days, including the Assumption of the Virgin, a major feast written in red ink ('red letter day'). It is illustrated with a drawing of the zodiacal sign, Virgo, typical of medieval calendar decoration. The saints' days include the Anglo-Saxon king and martyr, St Oswald, and the beheading of St John the Baptist.